The Old South Marlin Club #1 retained its two-day lead with another two fish adding valuable points to its overall total. Angler Susan Ward, fishing aboard Anxious, a 33-foot Bertram, tagged an estimated 180-pound Pacific blue marlin using 50-pound test line. “That was a tough fish and a tough fight. I can’t reel as fast as the guys, and the teamwork of Captain Neal Isaacs and his crew made all the difference,” Ward said. Her husband caught his second shortnose spearfish in two days, giving Old South Marlin Club #1 enough points to hold first place on Day Two of this five-day sportfishing marathon. Hilo Yacht Club, with three Pacific blue marlin tagged and released over two days, has vaulted into second place in the standings. Beginners luck? Today China’s PKU Sun Fun Club tagged two Pacific blue marlin, launching themselves into third place on the HIBT scoreboard. Fishing aboard Playtime, angler Duan Quancheng tagged his estimated 270-pound Pacific blue marlin in 42 minutes. Next up was first-time angler Yin Guochen, who tagged his estimated 150-pound Pacific blue marlin in a very impressive seven minutes. 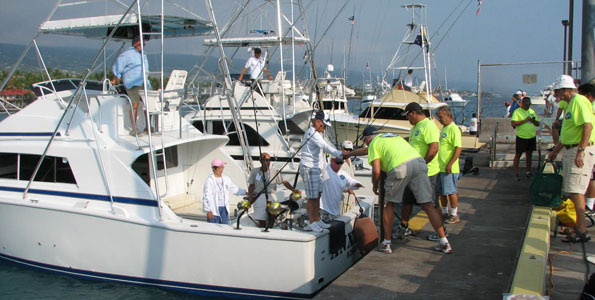 In fact, there are three new international teams debuting at the 2011 Hawaiian International Billfish Tournament – China, Singapore and Vanuatu. All three teams managed to put points on the scoreboard. Angler Ang Kha King, fishing with Singapore’s Xtreme Anglers, tagged an estimated 270-pound Pacific blue marlin in just over 40 minutes. Port Vila Game Fishing Club from Vanuatu also put points on the scoreboard today when angler Murray Parsons tagged an estimated 250-pound Pacific blue marlin in just six minutes. Vanuatu and the Port Vila Game Fishing Club are known for excellent fishing action in their corner of the southern Pacific. Angler Janice Allan from Whangaroa Game Fishing Club of New Zealand tagged an estimated 150-pound Pacific blue marlin, earning points for her team and sliding into second place on the women’s leader board. Veteran HIBT angler Fred Duerr of the Malibu Marlin Club boated his 162-pound ahi in 30 minutes. “This ahi wanted to continue swimming with its school. The line was getting chafed by other ahi in the school bumping it. I knew I had to reel it in quick,” Duerr said. In all, 13 billfish were tagged and released on Day Two – 9 Pacific blue marlin and four short nose spearfish – plus one qualifying ahi. The 2011 HIBT is comprised of five days of tournament fishing and continues through Friday, July 29.